Selena Garcia, a promising, pop/rock singer/songwriter based in Los Angeles, CA, has won the SongwriterUniverse ‘Best Song Of The Month’ Contest for May, for her song ‘100 Pictures’ (co-written by Drew Lawrence). This song is featured on her debut 5-song EP Don’t Worry It’s Not Love, which she released independently in February (2009). ‘100 Pictures’ is a gentle, uptempo pop song which has an appealing melody and is easy to listen to. The song starts out with a sparse, piano-based track, and then gradually builds into full band arrangement with strings. This recording provides a fine showcase for Garcia’s expressive lead vocals, plus her hooky background vocals in the chorus. ‘100 Pictures’ was expertly produced by Jim Roach, who also played bass and created the string track. Garcia was born in Bellevue, WA (near Seattle), and she grew up in both Washington state and in Northern California. She was introduced by her parents to classic pop music such as Motown and Whitney Houston, and later she was inspired by Eva Cassidy, Etta James and Tom Petty. Garcia learned to play some piano and guitar early on, and when she was 13 she started writing songs. After college, Garcia decided to move to Los Angeles to pursue her music career. 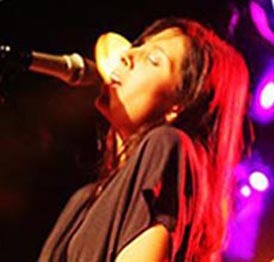 In 2005 she formed her first band, which included keyboard player Drew Lawrence, who became one of her writing collaborators. Notably, Garcia was named by Music Connection magazine in 2006 as one of Los Angeles’ Top Unsigned Artists. Garcia and her band have also played many shows in Los Angeles, and they’ve also toured the Northwest. In addition, in March Garcia played the Red Gorilla Music Fest in Austin, which coincides with the SXSW festival. Lastly, she has begun writing songs for her next recording project. Selena Garcia and Drew Lawrence of Los Angeles, CA. Performed by Selena Garcia. Ryan Martinez of Los Angeles, CA. John Mayock of North Granby, CT. Performed by the Mayocks. Mike Montrey of New Brunswick, NJ. Performed by Mike Montrey. Written by Louis Brown of Bremen, GA, Vicki Slappey and Phil Thomson.